Our chairwoman Linda Farquharson (Hugo’s) introduced the meeting and welcomed new member Ann Johnson from Blaze Manufacturing Solutions. Ann has a broad range of business experience and will be a huge asset to the club. There was such a lot to discuss in the meeting with lots of exciting plans for the group in the year ahead, and lots for club members to look forward to and be involved in this year. Following its tremendous success last year, the LBC plan to make the Laurencekirk Bonfire night an annual event, so the meeting was mainly devoted to the organisation of the 2014 bonfire. Saturday 8th November 2014 was confirmed for the event and John McWilliams has graciously agreed to donate the same field that last year’s event was held in. We plan to organise better lighting, including a tower with 4 spots which will give us lighting on the entrance and road, and will make parking much easier. Fiona Moore (EnviroSurveying) spoke about the Mearn’s F.M. roadshow which we have now booked for this year’s event; they will provide the P.A. system as well as stage lighting. Helen Kelly (Bonza Bouncy Castles) agreed she would organise the local bands again as they were a great attraction, and we are planning to invite a pipe band to open the event. Donna Allan (Impact Imaging) has confirmed the booking of a catering company experienced in catering for vast crowds, and they will provide food and refreshments throughout the evening. More volunteers will be required on the night and so plans were discussed for this arrangement; we aim to organise everything as much as possible so that the night runs smoothly and safely with no incidents. There will be plans to carry out the school ‘Guy’ competition again and also an Art competition to involve the children in the community. A raffle hamper will be held in Hugo’s after the success of last years raffle. Fundraising is paramount as it’s a free entry event funded by the LBC, and members want to ensure that the whole community is involved and see a fantastic Bonfire and firework display on the night. Other business. Discussion then followed of the possibility of the LBC organising a farmers market within Laurencekirk. Local resident Mr. David Lamb works within an area that would be of great benefit in helping this come about, so we discussed inviting him to the next meeting to see what it all entails. Marion Robson (Dickson Hall) informed the group about a wonderful Tea Festival that is coming to the Howe o’ the Mearns. The communities of the Mearns are coming together to run Scotland’s Tea Festival in memory of entrepreneur and tea planter James Taylor of Fordoun. The Festival is running from Friday the 22nd of August until Sunday the 24th of August, and Marion Robson and her team at the Dickson Hall will be taking part in a huge Guinness Book of Records challenge to serve over 600 Cream teas!! There will be something for everyone, so watch this space for more news on this event. We are planning to try and recruit new members to come along and be a part of the club, so please join us – any business, big or small is so welcome. The next meeting will be held at Hugo’s on Tuesday 29th April at 7pm with hopefully a guest speaker. 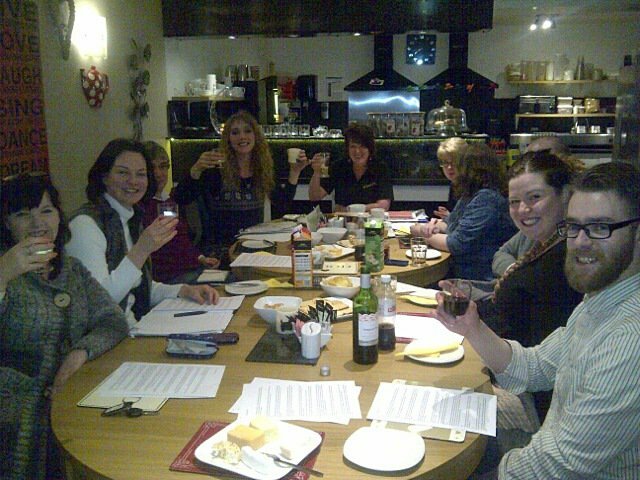 LBC members enjoying cheese and wine at last month’s AGM.